ALMOST ALL OF the homeless families that have been told to leave the Gresham Hotel by the end of the month have been sourced alternative accommodation. The Dublin Regional Homeless Executive – which manages homelessness services across the four Dublin local authorities – confirmed this evening that it had available accommodation for all the families in question. “We have been actively working with the families to ensure that suitable alternative accommodation is found for all of them,” a spokesperson said. The Gresham - formerly under the control on Nama – has previously been paid by Dublin City Council to temporarily accommodate homeless families over the past number of years. The families have been self-accommodating there – meaning that they sourced the place to stay themselves. 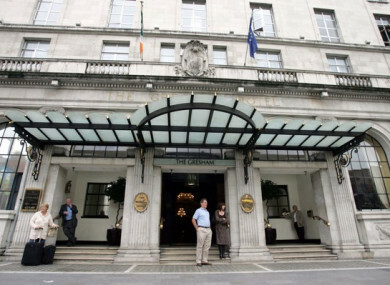 The Gresham was sold to Spanish hotel giant Riu in 2016 and the owners last month informed DCC that they would no longer be accommodating homeless families, due to refurbishments taking place. Community group Inner City Helping Homeless highlighted the case of the families last month. In a statement today, CEO Anthony Flynn said the group had been working with DCC to ensure the families were found suitable alternative accommodation. “A number of complex issues were on the table over the last few days and I am confident that the council will provide all families with alternative emergency accommodation,” he said. The end goal is that all families will be housed but in order to do so we need better supply in terms of builds. Latest figures show that there were 670 families in hotel accommodation in the region in November. Last week, DCC’s deputy chief executive Brendan Kenny said that other hotels would also soon stop accepting homeless families. Email “Alternative accommodation secured for almost all homeless families staying in the Gresham Hotel”. Feedback on “Alternative accommodation secured for almost all homeless families staying in the Gresham Hotel”.